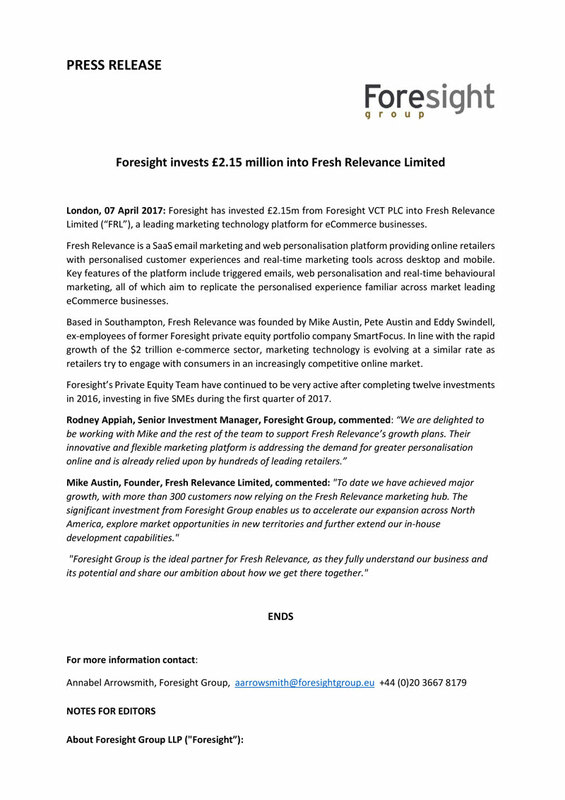 London, 07 April 2017: Foresight has invested £2.15m from Foresight VCT PLC into Fresh Relevance Limited (“FRL”), a leading marketing technology platform for eCommerce businesses. Fresh Relevance is a SaaS email marketing and web personalization platform providing online retailers with personalized customer experiences and real-time marketing tools across desktop and mobile. Key features of the platform include triggered emails, web personalization and real-time behavioral marketing, all of which aim to replicate the personalized experience familiar across market-leading eCommerce businesses. Based in Southampton, Fresh Relevance was founded by Mike Austin, Pete Austin and Eddy Swindell, ex-employees of former Foresight private equity portfolio company SmartFocus. In line with the rapid growth of the $2 trillion eCommerce sector, marketing technology is evolving at a similar rate as retailers try to engage with consumers in an increasingly competitive online market. Foresight’s Private Equity Team have continued to be very active after completing twelve investments in 2016, investing in five SMEs during the first quarter of 2017. Mike Austin, Founder, Fresh Relevance Limited, commented: "To date we have achieved major growth, with more than 300 customers now relying on the Fresh Relevance marketing hub. The significant investment from Foresight Group enables us to accelerate our expansion across North America, explore market opportunities in new territories and further extend our in-house development capabilities." "Foresight Group is the ideal partner for Fresh Relevance, as they fully understand our business and its potential and share our ambition about how we get there together."